Charlton mainline station is just a short ride on either a 486, 472 or 161 bus from North Greenwich underground station. All these buses start their route from North Greenwich underground so there is no confusion as to which way to go! Southeastern runs services to Charlton train station. Turn left out of the station and catch 486, 472 or N472 buses to North Greenwich, taking you approximately 10 mins to reach the front door of The O2. The M25 (London orbital), the A2/A20 (from the South East) and the M11 (from the North) all offer good access and The O2 is clearly signposted. The postcode for route and journey planners is SE10 0DX. If you need a junction please try Millennium Way or Edmund Halley Way. The O2 is adjacent to North Greenwich Underground and bus station..
North Greenwich station has its own dedicated taxi rank for up to 50 black taxis. In partnership with Transport for London the taxi rank is now marshalled after key arena events. Only taxis (black cabs) can be stopped by customers and can pick up off the street. Private hire vehicles cannot accept fares without being booked in a private hire office or over the phone first. Eight TFL bus routes operate to and from The O2 including three 24 hour bus services. Key destinations include Stratford, Charlton, Greenwich, Lewisham, Woolwich, Eltham and Central London. Please visit www.tfl.gov.uk for timetable information. 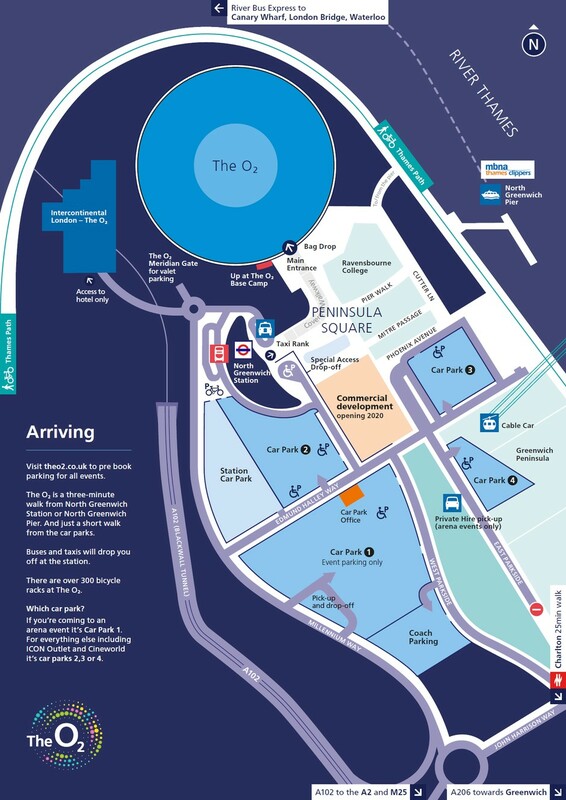 Car parking is available for all events at The O2 arena. It is highly recommended that your parking is pre-booked due to the limited availability of space. To purchase your parking call 020 8463 6718 (10am - 8pm daily). Pre-booked parking is 17.50 pounds plus 2.50 pounds service charge. Pre-booked tickets can be purchased up until 5pm on the day of an evening event or up to 2 hours before a matinee performance. Should you require assistance at arena events, please contact the information desks within the arena or ring 020 8463 2211 from doors opening time (stated on ticket). This is for point to point assistance at arena events only. If you have ticket for an ambulant seating area and you have your own wheelchair, your wheelchair can be left with customer services at the information desks on either Level 1 or Level 4 until the end of the event or a designated point within the event. Assistive Listening Devices are available for hearing-disabled visitors to The O2 arena. This device is an auditory enhancement system providing coverage of the seating bowl to both those with and without a hearing aid. The Assistive Listening Devices work with Hearing Aids with T-position settings, and with digital Hearing Aids. Alternatively, there are earphones available for those without Hearing Aids. Please visit the information desks on Level 1 or Level 4 of the arena and request an assistive listening device. Guests will be required to leave valid identification such as a driver's license as collateral. This is a complimentary service. Assistance dogs are welcome within The O2 arena. Assistance dogs may be taken onto access platforms, however, if you are seated within an ambulant seating area please contact a Customer Services Representative at the nearest information desk on either level 1 or 4 who will be happy to look after your dog for the duration of the event or a designated time during the event. Water bowls are available on request. 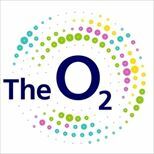 The O2 operates a dedicated disabled access booking line, please call 020 8463 3359. For information on disabled access, please call 0870 600 6140. You can also email them on access@theo2.co.uk.